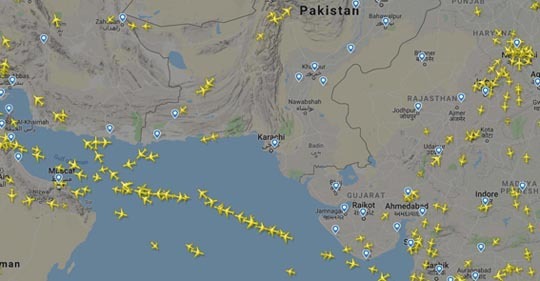 Of course the skies are currently empty of Boeing 737 Max aircraft, but as a result of the recent India-Pakistan dispute, from Wednesday 27 February Pakistan closed its airspace to commercial flights. All those flights between Europe and South-East Asia – Bangkok, Kuala Lumpur, Singapore – which would normally cross Afghanistan-Pakistan-India had to divert south over the Arabian Sea or north over China, flying rather further as a result. Normally there would be hundreds of Pakistan overflights a day, all of them paying the Pakistan government for overflight rights. ▲ I flew London-Singapore on 5 March while this was all going on and look at the FlightRadar24 picture above. There are domestic flights heading north-south over Pakistan and international flights from further west (Dubai, Doha, Riyadh, other Middle East centres and presumably from Europe?) flying to and from Pakistan, but nothing simply flying across. Look at all the flights lined up flying east-west and west-east just south of Pakistan. Ten days later nothing has changed. Zimbabwe Airways – Boeing 777 – registration Z-RGM (surely not for Robert G Mugabe?) was bought by the Zimbabwe government for US$40 million in April 2018 from Malaysian Airlines which has a bunch of 777s which nobody wants to fly on. Now Zimbabwe is close to bankrupt so there would have to be a really good case to splash out US$40 million on an old 777 right? So is it flying in lots of eager tourists to spend their money in Zimbabwe? Wrong, they had no way to service and maintain it, nowhere to fly it to and no crew (pilots for example) to fly it. So it soon went back to Malaysia and nearly a year later it’s still parked there. Presumably the Malaysians cashed the cheque as quickly as they could. Air Tanzania – Boeing 787 Dreamliner – registration 5H-TCG arrived in Tanzania in early July 2018 so over eight months ago now. At US$224 million it’s way more expensive than the Zimbabwe Airways 777, but then it’s brand new. So is it flying in lots of eager tourists to see the wildlife in the Serengeti or to climb Mt Kilimanjaro? Brits from London, Indians from Mumbai, Chinese from Guangzhou – those were some of the projected destinations? Wrong, it’s not totally stationary, like the Zimbabwean 777, but it’s just being used for one-hour local domestic hops, Dar es Salaam to Mwanza and back. And not every way of the week. In contrast Qantas can use their 787s for 17 hour non-stop flights between London and Perth. Which is what you need to do if you’re going to make money out of a US$200 million aircraft. Now Tanzania is not broke, like Zimbabwe, but the government has taken to shaking down charities operating in Tanzania for loose change. So wasting that sort of money is not a good idea. Check this story in The Economist on why the Tanzanian economy is sliding downhill. 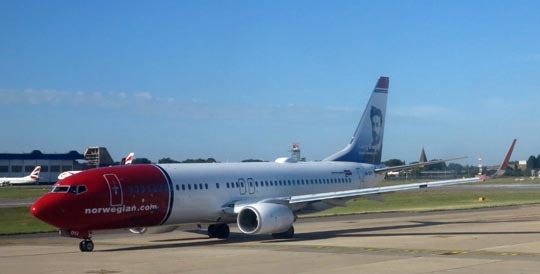 Norwegian Air – Boeing 737 Max – registration LN-BKE was stuck in Shiraz, Iran for over two months from December 2018. Since Norwegian Air has some financial difficulties and, unlike Air Tanzania and Zimbabwe Airways, does know how to work their aircraft they were clearly not happy about that. The Dubai-Oslo flight diverted to Shiraz following an engine problem, which presented a variety of interesting problems. Not all women passengers would have been equipped with the headscarfs which have to be worn in the Islamic Republic and presumably nobody would have had a visa for Iran. Never mind, the passengers were all soon flown out although they may be facing visa problems the next time any of them go to the USA, since America doesn’t like people to visit the Islamic Republic. I’ve got experience of that. But to get their almost brand new 737 back to Norway required bringing parts into Iran to repair it and there is a US embargo against doing that. Plus Donald Trump’s government shutdown stopped anything happening for over a month. Eventually the exemption was granted, the parts flown to Shiraz, the engine repaired, the aircraft continued to Oslo and then it was parked due to the 737 Max grounding following the Ethiopian Airlines disaster. Click here for an earlier blog on flag carriers and losing money with airlines.